Tickets for the English National Opera’s Man of La Mancha revival at the London Coliseum are now available! This Tony Award-winning musical is back in London’s West End for the first time in over 40 years! The triumphant return of Man of La Mancha is set to star multi-award-winning actor Kelsey Grammer. After their highly successful productions of Carousel, Chess, Sweeney Todd, and Sunset Boulevard that received rave reviews from both audiences and critics alike, Michael Linnit and Michael Grade are back at it again with Man of La Mancha, another powerhouse collaboration with the English National Opera. This semi-staged concert production is set to star American actor Kelsey Grammer, whose many awards include two Tonys, and Australian-American opera soprano Danielle de Niese. De Niese will be sharing the role of Aldonza with stunning vocalist and actress Cassidy Janson. They will be joined by Only Fools and Horses star Nicholas Lyndhurst playing the Innkeeper/Governor. Taking inspiration from Miguel de Cervantes’ seventeenth-century literary masterpiece, Don Quixote, and set during the violent Spanish Inquisition, Man of La Mancha follows failed playwright and tax collector Miguel de Cervantes as he is thrown into prison for attempting to tax a monastery. As he awaits trial, a kangaroo court threatens to confiscate Cervantes’ precious and uncompleted manuscript for Don Quixote. While giving his defence, Cervantes, along with his servant, suddenly transform into the characters of the very book he is trying to save. As both of their imaginations run wild, the duo, now believing themselves to be Don Quixote and Sancho Panza, do everything in their power to destroy evil, set things right and restore the age of chivalry that has long thought to be dead. Written by Dale Wasserman and featuring spectacular music by Mitch Leigh, you can look forward to such toe-tapping numbers as ‘Little Bird’, ‘I, Don Quixote’, ‘The Impossible Dream’, ‘I Really Like Him’, and ‘Dulcinea’. And with lyrics by Joe Darion, you'll be dancing and singing along to the chivalry beat long after the curtain falls! 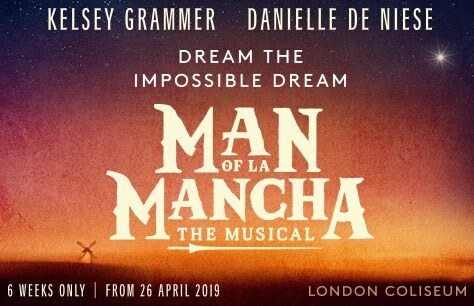 After four long decades, Man of La Mancha is finally back in the West End next spring! As a result of its 40-year hiatus, The Man of La Mancha tickets are guaranteed to be among the hottest West End tickets of the season. Book your Man of La Mancha London Coliseum tickets now to ensure the best seats in the house when you use our interactive seating plan! Please note that the role of Aldonza will be shared between Danielle de Niese and Cassidy Janson. Please see the performance schedule here.